I love Mondays, a new week, a fresh start, back to a normal routine after a hectic weekend. Last Monday I didn't have much hope of making much progress on Coastal Lily. I had a month's worth of doctor, veterinarian, hair salon, groomer, repairman, delivery man, car, and dentist appointments all in one week. But since I knew I had limited sewing time, I made the most of the time I had, which turned out to be around the same amount of sewing time in a normal week, when I tend to be less focussed. This project is coming together very easily and I feel like I make progress every time I sit down to sew. I have a few more geese to piece, but I'm almost done with them. I also have a few more berries to make, but I'm still enjoying the process and expect to wrap them up soon. All the pieces and parts for the lily block are assembled and ready, all I need is the berry block then I'll be able to start piecing them together. The stack on the right are the bloom block pieces, the two stacks on the right are the scraps! If you're still in the mood for a bloom quilt, but haven't taken to Carolina or Coastal Lily, Judi at the Green Fairy has just started a Flower Patch Quilt Along, maybe you would like that, click here to check it out. Well, this quilt is coming along nicely Thelma and seems like it is a bit faster than the Carolina quilt. 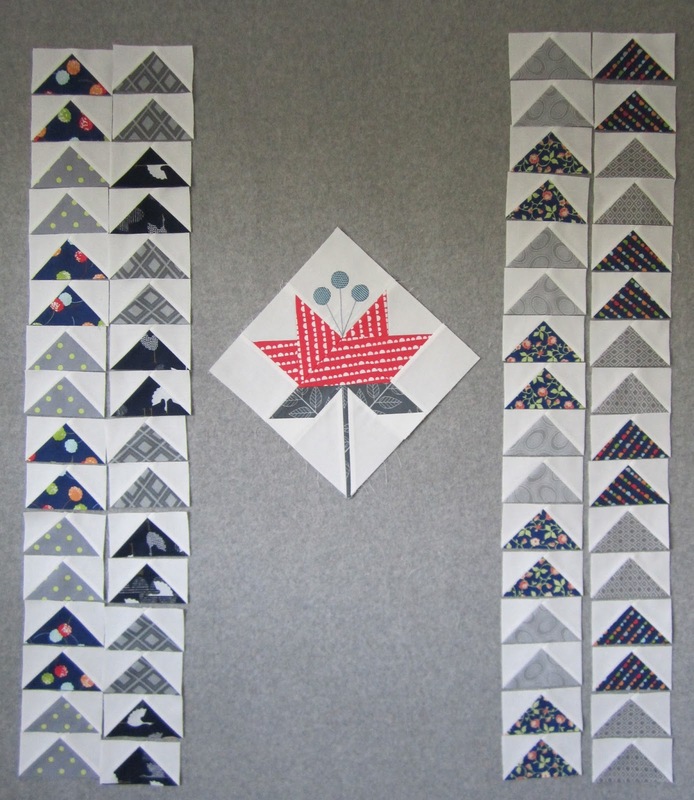 Glad you were able to get in good sewing time and looking forward to seeing the blocks come together. Your block and the geese are adorable! Love your fabric choices! Both of those quilts look great. I may have to pick up one of those for some summer sewing. Love the basket full of berries! I have those templates somewhere in the stash. The problem is, the circles I need to make are teeny tiny eyes for a gingerbread man. I may just be inspired to try them again...! You really are moving right along...it seemed like it would be such a big job, but I've learned from experience that tackling a big job is like eating an elephant. Just one bite at a time gets the job done! I am very anxious to see the finished result. Lovely colours and you are speeding along with this Lily quilt! Great to follow your progress. 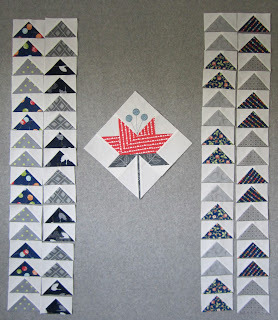 Gosh Thelma, only you can make a pile of scraps look good :) Congrats on your progress!